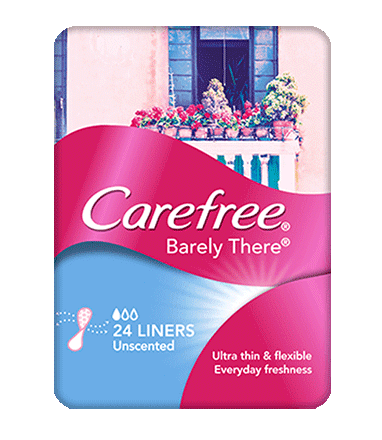 CAREFREE® BARELY THERE® Unscented Liners feel just like the name suggests – barely there! They’re made for the days in-between your period, so you’ll feel fresh throughout the day. They follow the movements of your body and can be folded like wings to fit your G-string. A drop absorbency rating of 1 means they are suitable for light discharge. Wash and dry your hands with soap and water. Remove the liner from the wrapper. Peel off the long piece of paper that covers the sticky back of the liner. Place the liner sticky side down to cover the crotch panel of your undies — the area that goes between your legs. Be sure not to put it too far to the front or back. Dispose of the liner after it has become saturated. Pull it off your undies and roll it up like a sleeping bag in the wrapper from your fresh liner before disposing of it in the bin. Never flush a liner down the toilet. Change as needed, we recommend approximately every 4 hours during the day.